Order Now at a 54% Discount And Receive Free Shipping! New Creation All IN ONE Moisturizer Anti-Wrinkle Hypoallergenic Eye Creation Cream FOR ALL SKIN TYPES BY USING THE RIGHT COMBINATION OF THE FINEST INGREDIENTS AVAILABLE, the New Creation™ EYE CREATION CREAM CLEARLY OUTPERFORMS PRODUCTS THAT RETAIL FOR HUNDREDS - EVEN THOUSANDS OF DOLLARS! Our New Creation™ EYE CREATION CREAM is carefully formulated with a balance of Natural Ingredients and Modern Technologies that are proven and achieve remarkable results in the control of Wrinkles, Crow’s Feet, Dark Circles and Puffiness around the eye. The New Creation™ EYE CREATION CREAM is made with love and integrity using the finest ingredients available. The development of the New Creation™ EYE CREATION CREAM has been over twenty years in the making! 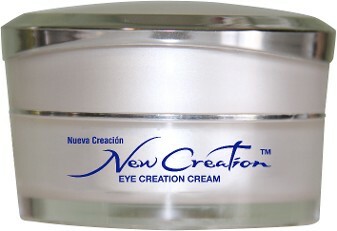 What makes the New Creation™ All IN ONE EYE CREATION CREAM the best? The New Creation™ EYE CREATION CREAM is TRUE HYPOALLERGENIC and contains a LAMININ-5 PEPTIDE (Laminin is a protein that holds the body together) designed to help preserve skin integrity and the dermal-epidermal junction, also, MARINE COLLAGEN with 21 AMINO ACIDS (the building blocks of life!) The New Creation™ EYE CREATION CREAM is a super-moisturizer and has the exact balance of both Natural and Modern Technologies derived from natural sources which include, Hyaluronic Acid, Vitamin E, Vitamin K, Peptides (Amino Acids linked by bonds to obtain desired properties), Aloe Vera Gel And Other Natural Plant Extracts and emollients that - when used at the correct levels - are proven by Science to be safe and to reduce wrinkles, dark circles and puffiness around the area of the eye making it the ONLY TRUE ALL IN ONE product on the market! The New Creation™ EYE CREATION CREAM is Hypoallergenic, Paraben-Free, Fragrance-Free, Silicon Free and has no colored pigments. Our purpose is not to cover up the eye’s imperfections with make-up but to improve to a more youthful, natural appearance. Our EYE CREATION CREAM is FOR ALL SKIN TYPES and applies smoothly and does not leave your skin feeling greasy. New Creation Eye Cream Video! Say good-bye to wrinkles thanks to the proven beauty products from New Creation Products. We manufacture an eye cream that our chemists have been perfecting for more than two decades. Available only online, our product slows the aging process and keeps your skin healthy. We believe in this product, and we want to help you reduce the effects of aging today. Every batch is manufactured under the close monitoring and supervision of our formulators in accordance with a stringent quality control protocol to maintain high levels of quality. your natural beauty with our anti-wrinkle eye cream.